The global environment is constantly changing and our planet is getting warmer at an unprecedented rate. The study of the carbon cycle, and soil respiration, is a very active area of research internationally because of its relationship to climate change. It is crucial for our understanding of ecosystem functions from plot levels to global scales. 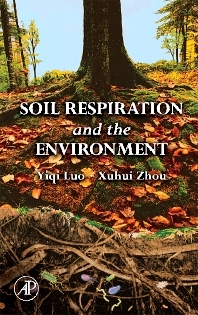 Although a great deal of literature on soil respiration has been accumulated in the past several years, the material has not yet been synthesized into one place until now. This book synthesizes the already published research findings and presents the fundamentals of this subject. Including information on global carbon cycling, climate changes, ecosystem productivity, crop production, and soil fertility, this book will be of interest to scientists, researchers, and students across many disciplines. Graduate and undergraduate students, professors and researchers in areas of ecology, soil science, earth system science, atmosphere, climate molders, biogeochemistry, agronomy, horticulture, and global change biology. Woods Hole Oceanographic Institute, Massachusetts, U.S.A. University of Oklahoma, Norman, U.S.A.
University of Oklahoma, Norman, U.S.A.